Photo by kashgroves in the Beacon Hill Blog photo pool on Flickr. Those planning to attend Tuesday’s Neighborhood Greenways meeting at the Beacon Hill Library via bicycle might be interested in a guided tour of Beacon Hill’s 18th Avenue South Greenway before the meeting starts. Kashina Groves from Beacon BIKES will be the tour guide. 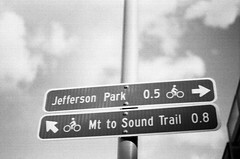 The tour leaves from the junction of the Jose Rizal bridge and the Mountains-To-Sound trail at 5:30 p.m. and will arrive at the library just before the 6 p.m. meeting.